“What ever happened to TBM?” I’ve been getting this question a lot lately. I have hesitated to tell the truth because so many millions of men around the world look up to him —but the awful truth must come out. TBM was vanquished by work. Yes, that killer of adventure, soiler of fantasy, shroud of exploration … sheer, overloading obligation. I tried valiantly to break away for a few days of tent camping in the cooler mountain elevations of northern Arizona, and some day trips, but again and again I was restrained at my desk by 1,001 projects that all needed attention. Well, don’t feel too badly for TBM. I still ate out at a few favorite restaurants, watched a few guy movies, met some local friends, went to a car show, etc—so it wasn’t all bad. And to rationalize the situation, I resolved that in exchange for a late summer of Airstream travel (which we have since begun) it was a reasonable tradeoff to spend a few weeks in advance chained to a desk. Back in New York at Colin Hyde’s shop, our Hensley hitch was being refurbished, and boy did that turn out to be an eye-opening experience. You might recall that we disassembled it and found many more worn parts and cracks than expected. 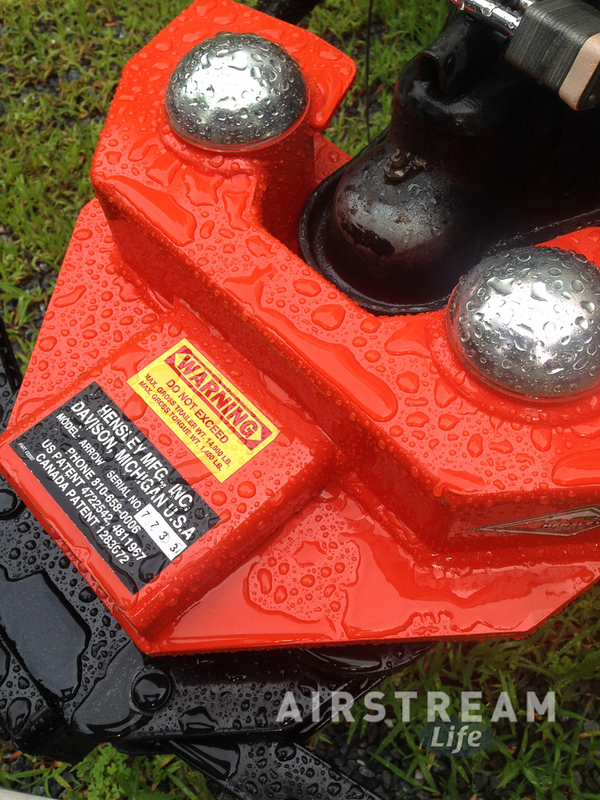 All the new parts were installed, and then of course we greased it, installed it, and adjusted it. It looks better than new now, which is good because the grand total for this job was more than half the price of a new one. The eye-opening part was discovering all the parts that had failed without our knowledge. 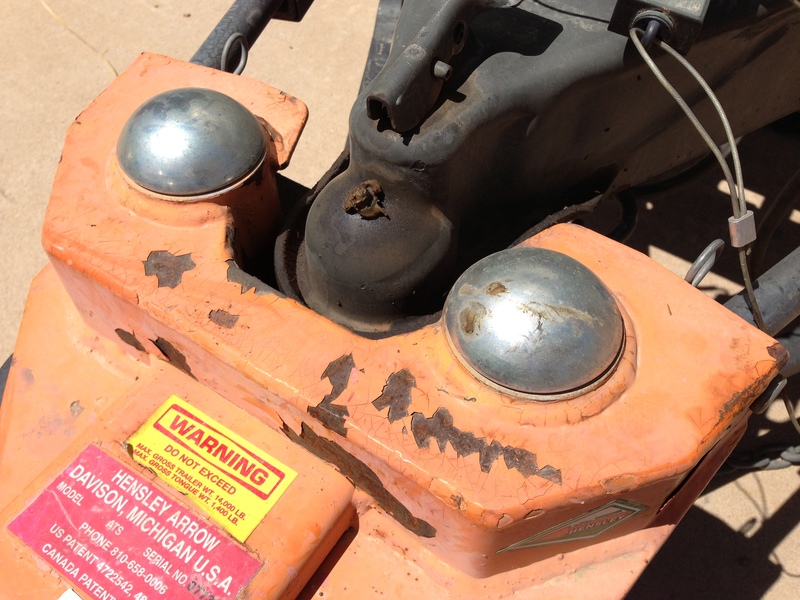 I knew the lower unit had cracked and suspected that the cadmium-plated steel bushings (“binoculars”) were also cracked. I didn’t know the extent of the cracking—and it was extensive—nor that the steel cylinders where the weight bars are inserted had stretched beyond repair. The really shocking part was the bearings. There are eight of them in a Hensley, standard automotive-type bearings and races. You’d think that since they barely turn they wouldn’t wear. In fact the opposite seems to be true. Despite being packed with grease, all eight bearings and races were seriously rusted. It seems that the lack of spinning allows water to settle without being evaporated. The “dust caps” on the top and bottom aren’t waterproof, so water gets in and stays there, particularly on the bottom bearings where the dust caps actually trap water. The picture says it all. Look at the rust on the bearings and the wear marks abraded into the races. These bearings were about six years old. All of them were bad. The bearings are user-replaceable but the races are not. Colin’s guys found a way to remove the races, which involved welding little tangs on the races so they could be punched out, but for most people the solution will be to return the unit to Hensley under warranty. 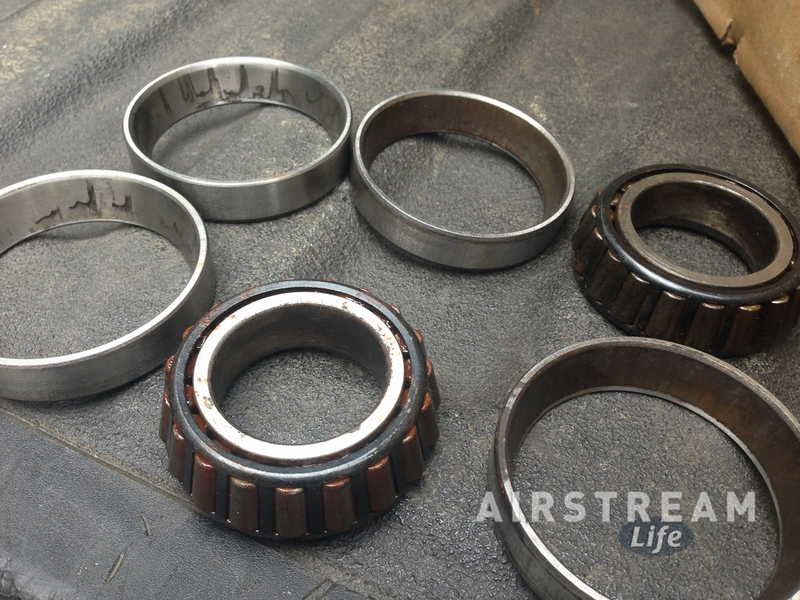 My recommendation to all owners now is to do five-year inspection and/or disassembly to check the state of these bearings, particularly in a wet climate. When you look at this picture, keep in mind that my trailer spends 8 months of the year in sunny dry Arizona. We’re now in the Airstream on a two month adventure that will take us from east coast to west, at least six national parks, and many interesting stops. So buckle up: the blog is about to get busy again. I’ve been looking forward to this summer for a long time. I was overloaded with work and projects from January through May, so once everything (including Alumapalooza) was done, I intended to switch back to the activity I like best: traveling. After picking up E&E in Cleveland, we had our usual decompression session in Ohio, including some game playing with our Woodruff/St Peter friends and a nice visit to the Frank Lloyd Wright “Welztheimer-Johnson House” in Oberlin. 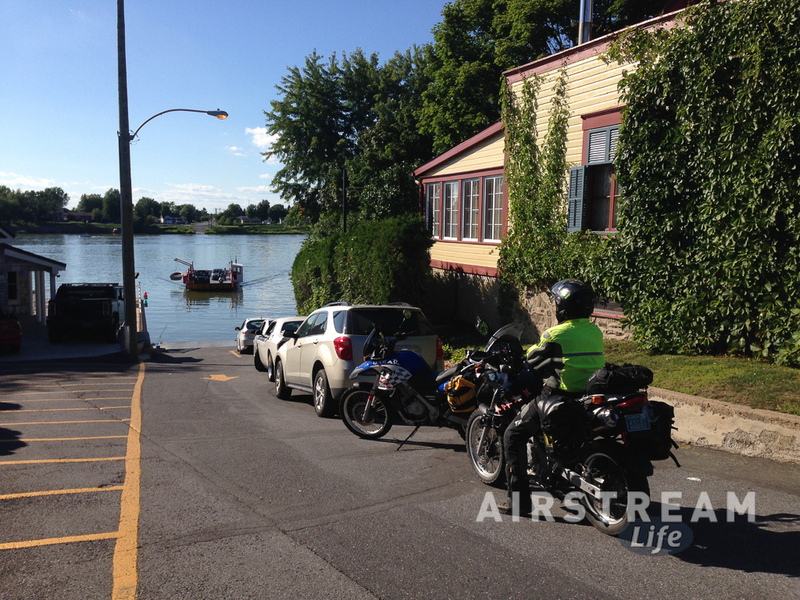 Then we zipped across New York to settle the Airstream in Vermont on the shores of Lake Champlain. The Airstream will stay here until early October, while we use it as a summer camp and base of operations. 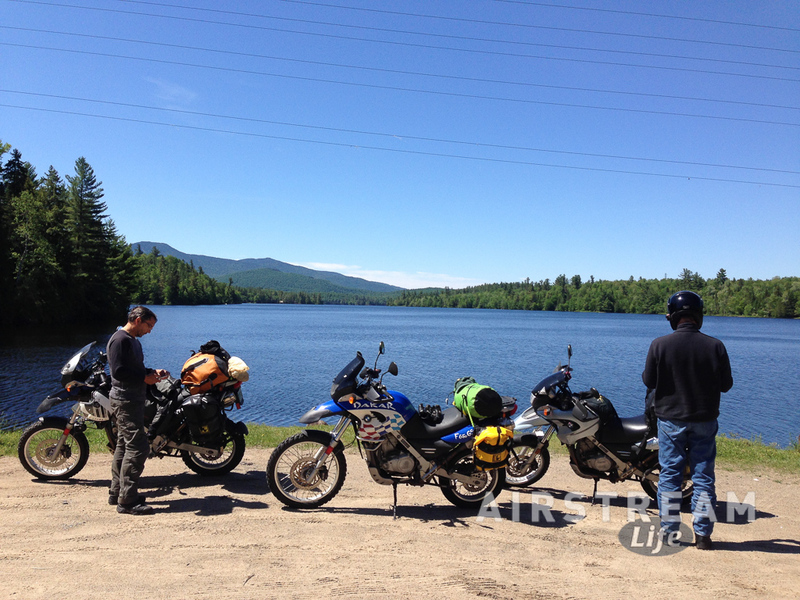 The first major adventure on the schedule was a motorcycling trip with my brother Steve and our friend Eric, much like last year’s exploration of the Gaspé Peninsula in Quebec. It seems that taking the BMWs out for a rough road trip is becoming an annual tradition, since we’ve been doing it every summer since 2012. 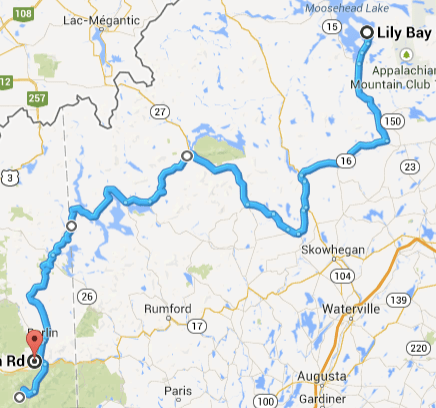 This year we scaled back a little compared to the Gaspé trip, planning just six days in New York’s Adirondack State Park. Six days might seem to be a lot for a state park if you aren’t familiar with the Adirondack region, so keep in mind that the “park” is actually about 1/3 of the entire state of New York. By backtracking and wandering down every dirt road we could find, we managed to accumulate over 1,000 miles of travel. Traveling like this is not what you’d call comfortable, but that’s part of the point. We are out to explore, and for me it’s a chance to explore in ways that we wouldn’t normally do with the Airstream. 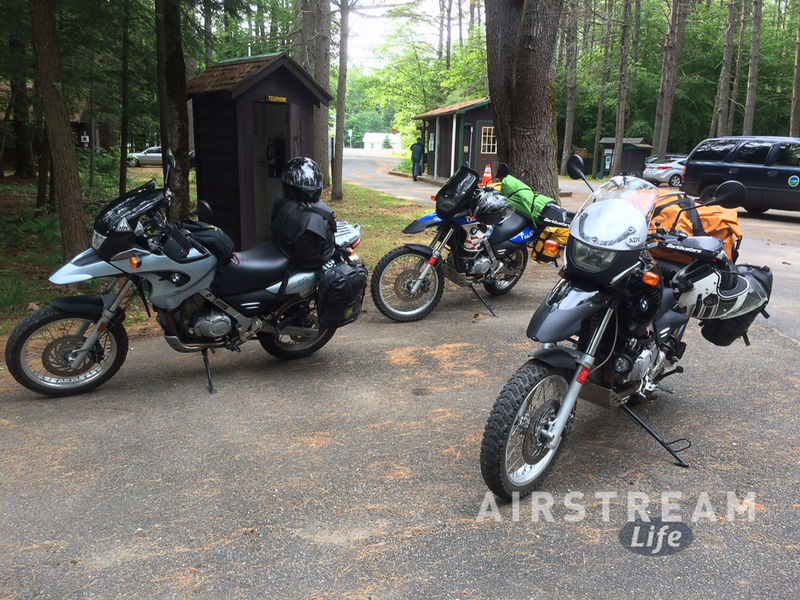 These motorcycle trips are conducted with minimal gear, only what we can carry on the back of the bike: tent, sleeping bag, pad, some clothes, a few tools, snacks, and not much else. We spend every night in the tent unless it’s pouring rain when we have to set up or tear down. This year we managed five nights out of six in the tents despite massive rains on several nights. The Adirondacks are known for their beautiful mountains and rugged wilderness, rustic lodges and camps that are relics of the Golden Age, quaint towns, and biting insects. All of these things are present in abundance, but there are also many reminders of their industrial origins: abandoned factories and paper mills, dozens of dams, long-closed mines and flooded quarries, decaying brick buildings, grassy old rail lines, and logging roads. People forget that the Adirondack infrastructure was first developed not for tourists or sportsmen, but for miners of lead and iron, loggers of trees, and railroads to carry all the plunder and materials to away to cities in the 19th century. 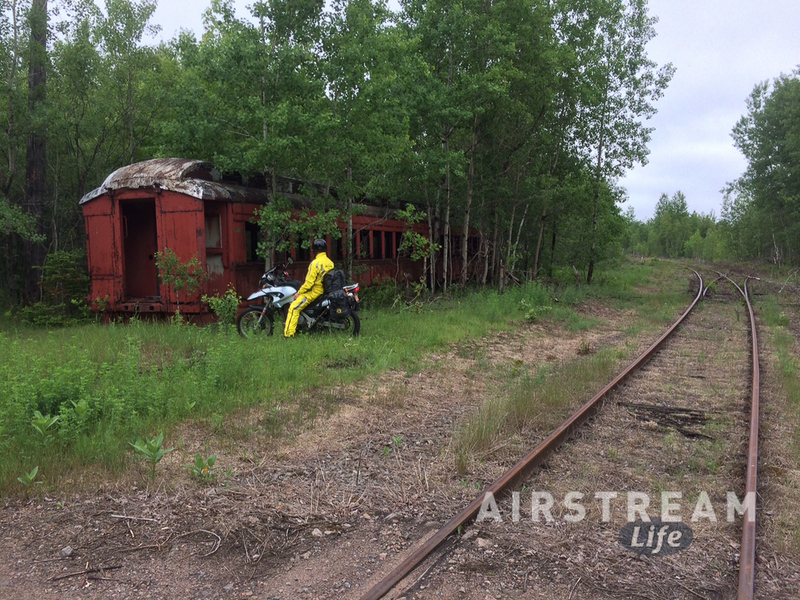 While many rail lines have become snowmobile trails and many dams have been converted to produce clean hydroelectric power, there’s still plenty of evidence of the past, and that’s what Steve and Eric like to explore. They are sort of “Rural Explorers,” hunting up mines, rails, dams, factories, mills, roads, and airports that have been left to slowly decay. While my fellow travelers do respect the law (at least in moderation) and don’t go past locked gates, they do have a tendency to go in places that—while not technically trespassing—the general public would not be welcome. But I suppose it’s good for me to test my own boundaries and even stretch them a little. What’s the worst that could happen? Hmm …. we could get arrested, yelled at, injured, lost, or encounter a group of zombies. So lots of things could happen. Nothing spectacular actually did. 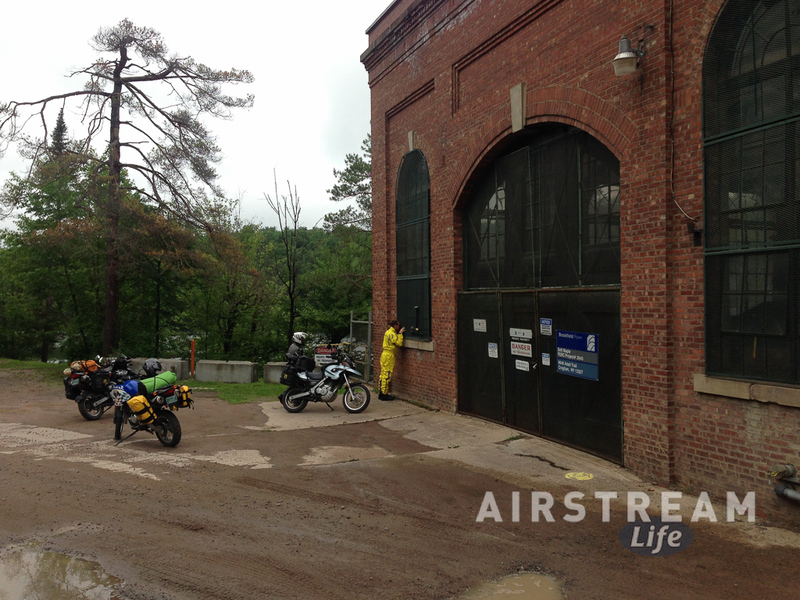 Perhaps the toughest experience was when we rode a few miles around a large flooded quarry and discovered we could not get out because all of the gates (other than the one we entered) were locked or barricaded. This required back-tracking through some fairly technical road conditions including loose sand and rock, large mud puddles, steep hills, and washouts. 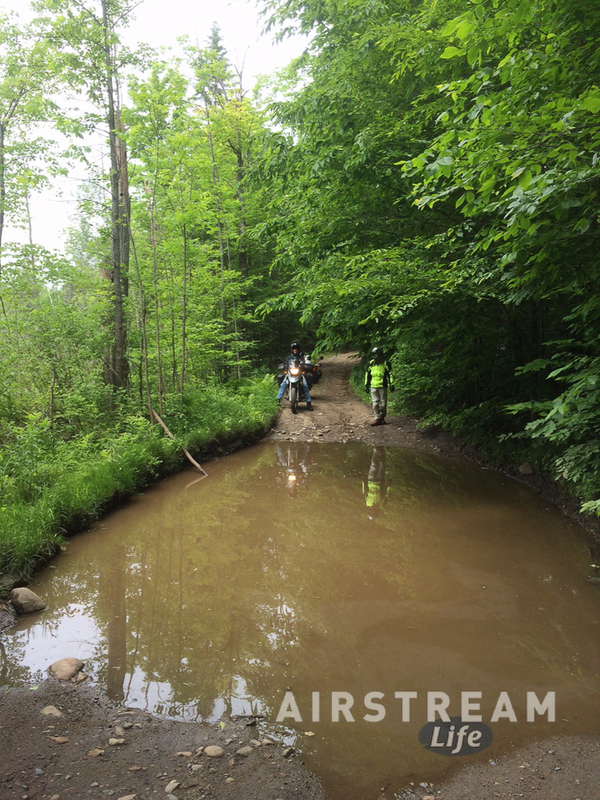 The photo at left shows the one mud puddle we decided not to cross during our six-day trip. Puddles are deceptively hard on a motorcycle. You might easily ford such a place with four wheels, but on two wheels it’s easy to get stuck in a muddy bottom, or slip. Either way the result is unpleasant. Slipping in a small puddle last year in the Gaspé gave me a shoulder injury that hurt for seven months. 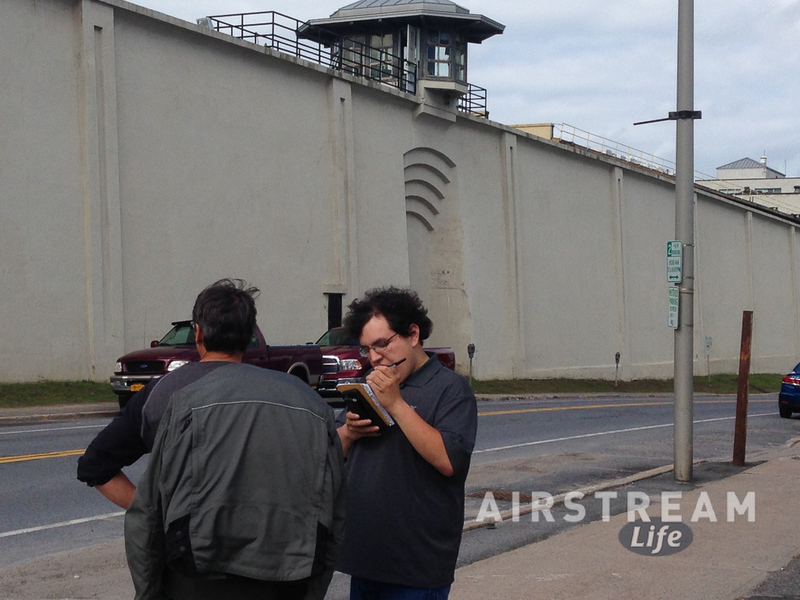 The biggest drama of the entire trip was about the escaped prisoners from the prison in Dannemora NY. 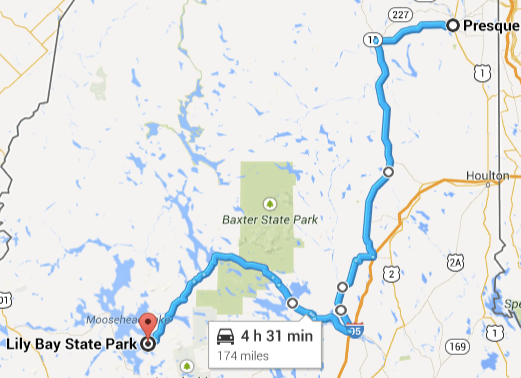 Everyone in the Adirondacks was talking about it, in every cafe, store, campground, and gas station we visited. We certainly didn’t relish the idea of encountering the two desperados while camped overnight, so each day began and ended with a quick check of the news to see if they’d been caught yet. We finally decided that at least if we found them we’d stand to collect the $100,000 reward (assuming we lived to tell the tale), and the survivors could split it. As you probably know, the escapees are still at large, so we are not any richer but we’re also not dead. Blackhawk helicopters buzzed overhead, and the impact of the $1 million/day cost was evident in every convenience store and restaurant as officers came and went all day long. We were stopped at three checkpoints near Dannemora to be positively identified as someone “not matching the description” before we could proceed. Other than intruding into crumbling old structures, the other big joy for Steve is to find the most rugged roads possible so that we can all use our BMW F650 motorcycles for their highest purpose. 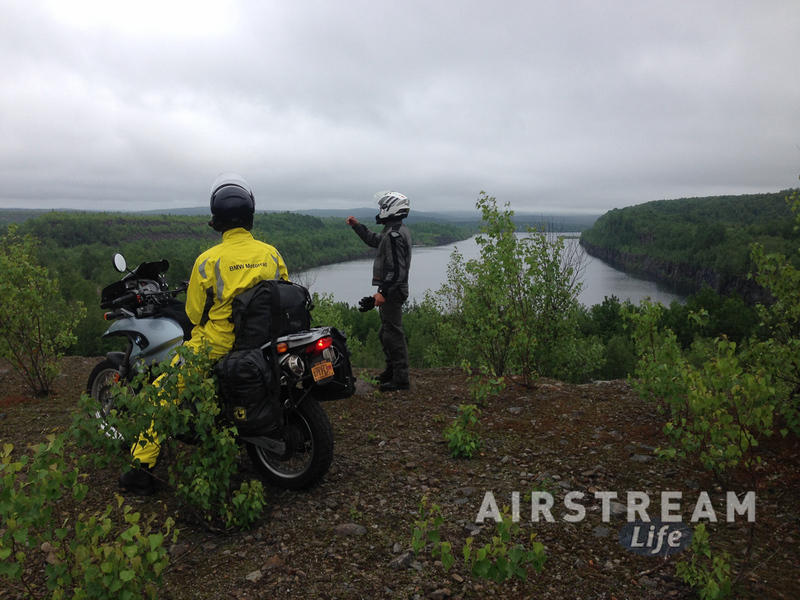 These are “Dual sport” bikes, meaning that they are equally happy on pavement and washed out dirt roads. The Adirondacks have plenty of both. I am sure that we averaged about 50% dirt because every time Steve spotted a dirt turnoff to nowhere, he’d zip off like a dog chasing a squirrel. Eric and I just followed without question and hoped for the best. The photo at left shows one of the poorer results (or “better” depending on your point of view). 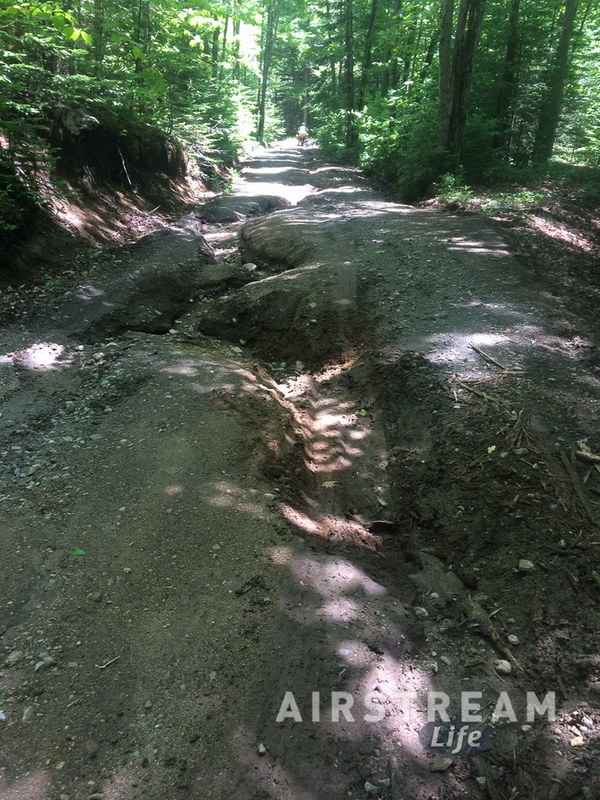 Lots of rain lately has left many of the roads looking like this. Those roads are posted with big yellow signs that say “Seasonal Use Road — Limited Maintenance,” which is like waving a plate of Buffalo chicken wings in front of my brother’s nose. He will go after it. Fortunately, none of us crashed or dropped a bike during the entire trip. And truly not knowing what’s around the next corner can be both thrilling and rewarding. Sure, it’s quite possible that if you don’t plan you might miss something, but if you don’t plan you might also find something that the guidebooks won’t tell you about. Rain was the other minor drama of the trip. 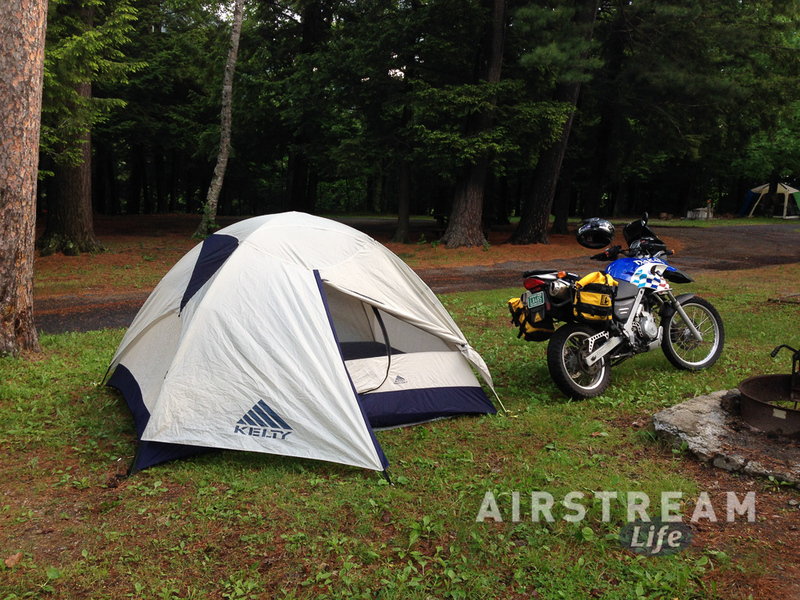 There is no such thing as a dry week in June in the Adirondacks. Our first night at Lake Luzerne State Campground was a full-blown thunder-and-lightning experience with heavy rain that left a small lake under my tent. I found a live salamander there while packing up the next morning. Our second night at Lake Durant State Campground was pleasantly dry, but the next night was forecast to be so dismal that we took refuge at a nice end-of-the-road motel at the edge of the remote Stillwater Reservoir. The fourth night at Meacham Lake State Campground was technically not rainy but there was enough condensation that it was hard to tell, and in any case we were already soaked because we got caught in a massive storm earlier that morning which forced us to hole up in a small town convenience store for three hours. The fifth night at Wilmington Notch was dry enough that my boots went from “soaked” to “damp” overnight—about as good at it gets while tent camping—and we had a final day of riding where all the forces of nature aligned to give us perfect weather. All things considered, we did pretty well. I don’t expect the comforts of the Airstream on this sort of trip. It’s about different values: exploration, camaraderie, simplicity, challenge. 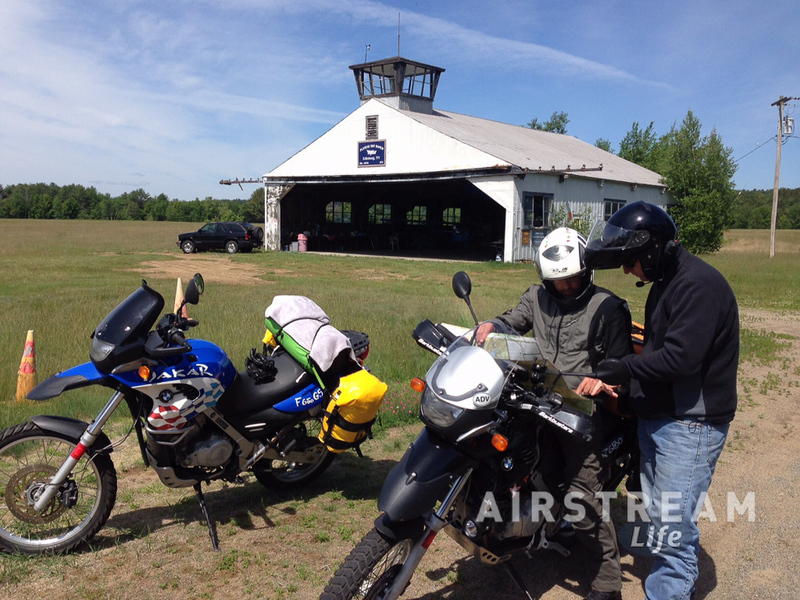 Men and machines, sleeping in tents, slapping away black flies, and eating in 1-star diners. Lots of time to think while the pine trees slip past and the single cylinder of the motorcycle thumps. One mile on a slippery, potholed dirt road can be just as memorable and exciting as anything else we might do in life. I hope we’ll do it again next summer.